No child learns everything it needs to know from their parents. This is not meant to deride a parent, or to fault a family, but instead to acknowledge the contributions that others bring to our children. One of the people who contributed to my daughter’s growth, is a woman I shall call “Grace.” She was one of Alexandra’s mentors about ten years ago. Grace was very supportive of my daughter and treated her as a professional. That meant a lot to Alexandra… and to me. We all want our children to succeed in this world and we are lucky when they can find friendly guides along the way. 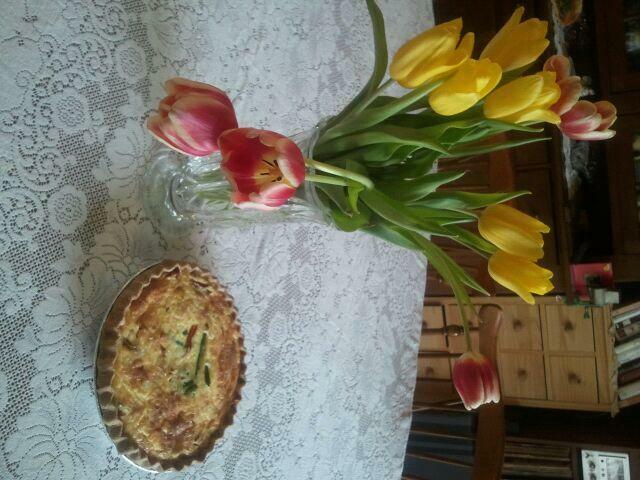 On this fine March day, I made an Asparagus, Roasted Pepper, and Swiss Cheese Quiche and brought it to Grace. I want to thank her for being the wonderful, caring person that she is, and for modeling that behavior for others. ← Day 353: Happy Birthday Aaron! Very well said Karen! I don’t know what I would have done without the incredible guidance that other special people had on my children! Nor do I Connie. We are so lucky! Thanks so much for writing!